A boutique event design firm with a stellar reputation in the music, fashion and financial industries, OTR is expert in producing experiential, artisanal landscapes for event and sponsor marketers that maximize activations and brand awareness. We can originate the concept or fulfill yours. Inexhaustibly innovative and whip-smart, we take as much pride in blowing minds as we do in never being the ones you’re worried about. For all of our branded events—product launches, premieres, galas and VIP lounges—we’re creating intimate, rarified, hand made environments from a vast inventory of decor staples and our own, ever-growing collection of rare oddities. We build nearly everything ourselves and excel particularly with floral design. What we deliver is an artful and unexpected experience, one that can rouse people who have seen and done it all to expand your social media footprint. With over a decade’s worth of experience we’re in many ways a well-oiled machine but there’s nothing mechanical about our relationship to your brand. At the outset we’ll insist on going deep with you to identify your audience and uncover the core energy we want to bring to the surface. You won’t be anxious about whether or not we “get it.” We’ll get it. Let’s start the conversation. Call (646) 328-2546 or email info@otrcollective.com to connect. 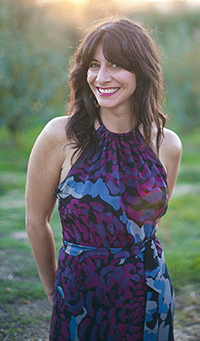 Kerri has been conceptualizing and designing special events since 2000, bringing creative design and concept execution to fruition for brands ranging from Fortune 500 companies to prominent individuals and their private celebrations. She is an accomplished skilled strategist with an eye for artful conception and design paired with a relentless attention to detail. Her concepts start with a personality and are finished off with original designs featuring incredible amounts of detail. Whether she’s sourcing the perfect vendor or staying up for 24 hours to make it happen (because she knew she could), Kerri has an uncanny ability to bring any idea to flawless fruition. Prior to “show-time”, if you can’t find her in a back corner with a smile on her face, it’s because she’s somewhere in the venue, scratching her perfectionist itch and still has her tool belt on, making sure the lighting is just right so the shadows of the floral arrangement perfectly complement the design of the rug. She won’t stop until she knows it’s right. © 2016 OTR Collective. All rights reserved. Site powered by Engine Red Marketing.